Prepare grill. If using bamboo skewers soak in warm water 15 minutes. Pat salmon dry and cut into 16 cubes. Cut zucchini into ¾-inch-thick rounds. In a bowl stir together wine, oil, dill and garlic. Add salmon, zucchini, and tomatoes, tossing to coat, and let stand, covered, at room temperature 15 minutes. Alternately thread salmon, zucchini, and tomatoes onto skewers and season with salt and pepper. 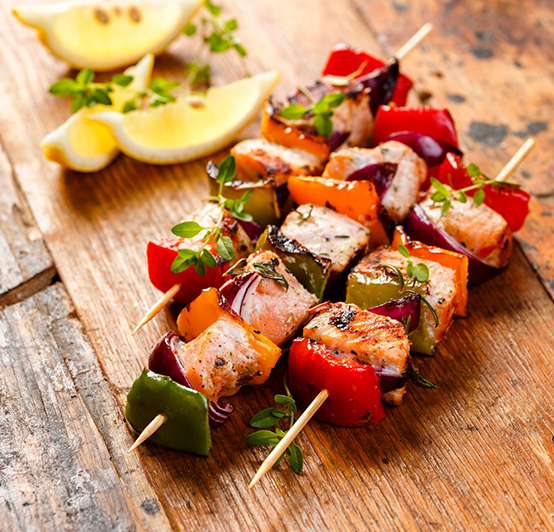 Grill kebabs on an oiled rack set 5 to 6 inches over glowing coals, turning kebabs, until salmon is just cooked through, 6 – 8 minutes. (Alternatively, kebabs may be broiled under a preheated broiler 3 to 4 inches from heat.) Serves 4-6.